I hope this week has been going well for you. 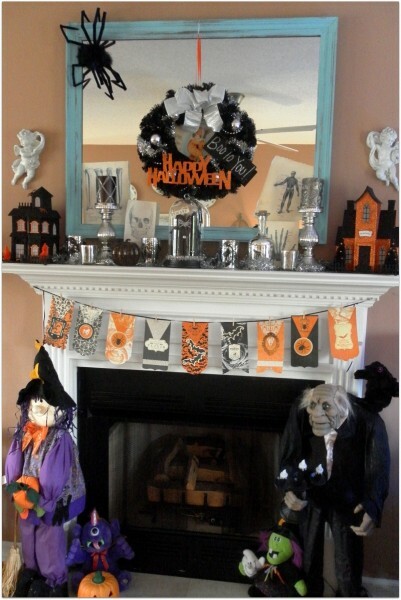 Slowly but surely I have been getting my house ready for Halloween. 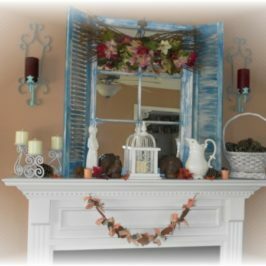 One of my favorite things to decorate in my home for any holiday is my fireplace mantle. 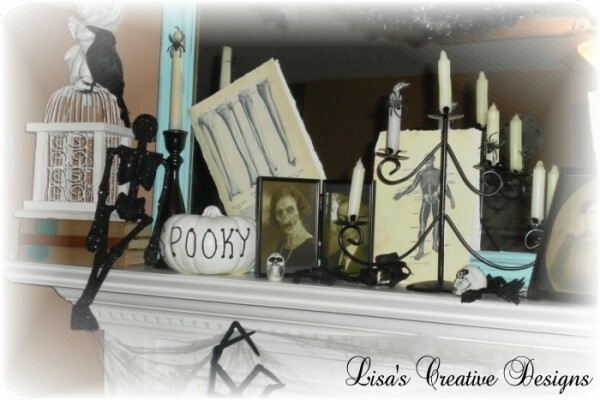 I thought it would be fun to share some photos of my Spooky Halloween Mantle today. Every year I try to change it up a bit. This was my design from two years ago…. 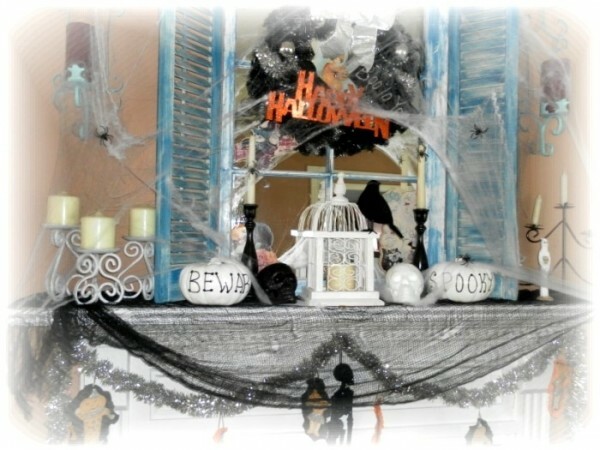 I went a little nuts with the faux spider webs that year. 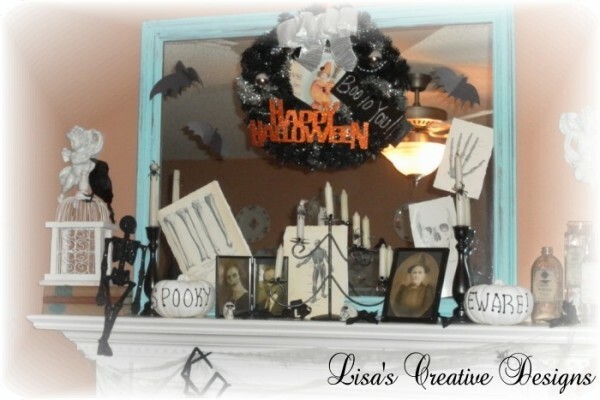 I mixed in some creepy Halloween decor with my every day decor. Last year I lost most of the spider webs and added some eerie photos of long-lost relatives taken after a night out on the town. 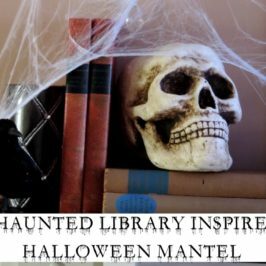 AAAAh, although sometimes I feel like one of those ghastly ghouls when I wake up in the morning, they are photos I printed off the internet! The white Styrofoam pumpkins were Dollar Tree finds that I painted and added some “Spooky” letters to. The vintage skeleton images were from The Graphics Fairy. I printed them on card stock, tore the edges and displayed “as is”. Pretty simple. This year I went a little more “vintage glam” with a bit of glitter…. It’s no secret that I am a mercury glass fiend. 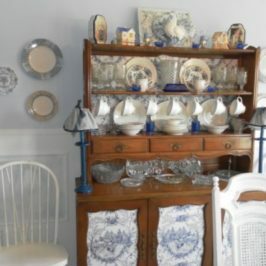 I am always adding to my collection even though I tell myself I have enough! 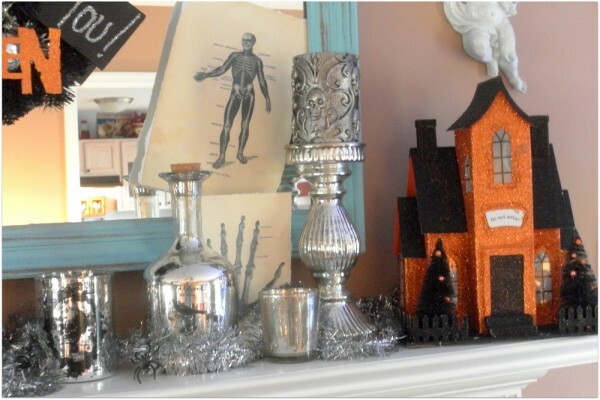 I found these beautiful glittered “haunted” houses on clearance at Marshall’s last year after Halloween. 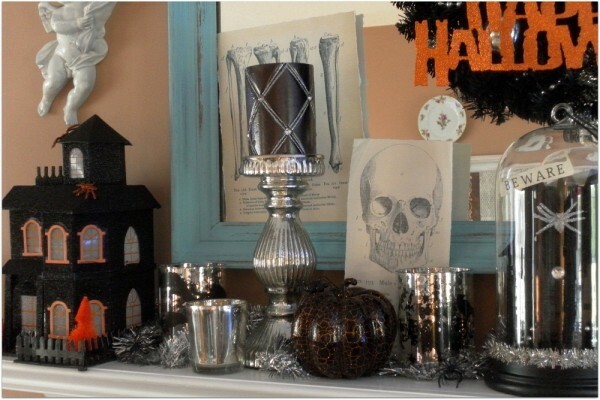 I also nabbed a set of three mercury glass macabre votive holders on clearance for $2! You can’t beat that deal with a stick! The large pillar candles are from Michael’s, bought on sale last year. 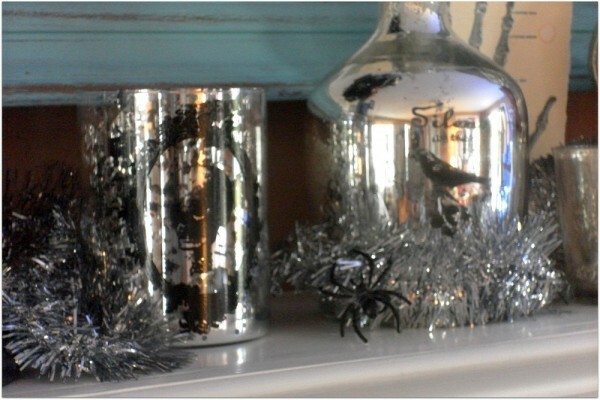 I think they look great on my everyday chunky mercury glass candle holders. 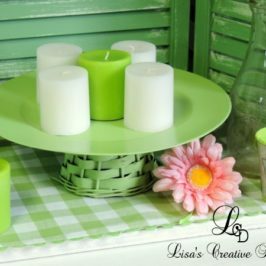 The bottle is new this year, bought at T.J Maxx and a closeup of one of the $2 candle holders from last year’s clearance bin. 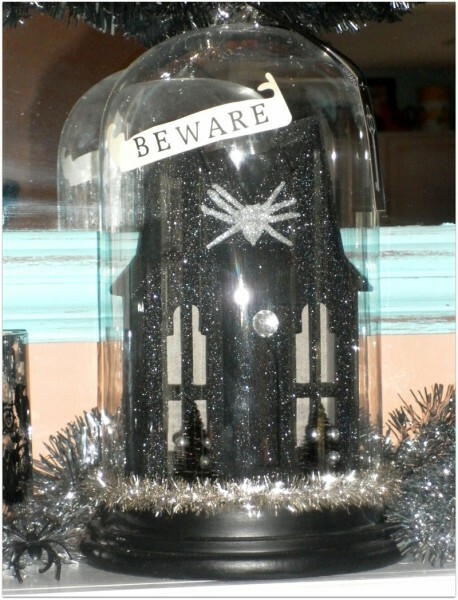 I fell in love with this domed, black glittered haunted house when I saw it at TJ Maxx. 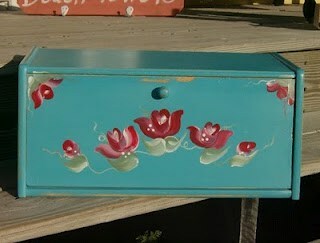 It was not on sale, it was not real cheap but I HAD to have it. Sometimes you just have to treat yourself and at $14.99 it did not break the bank. 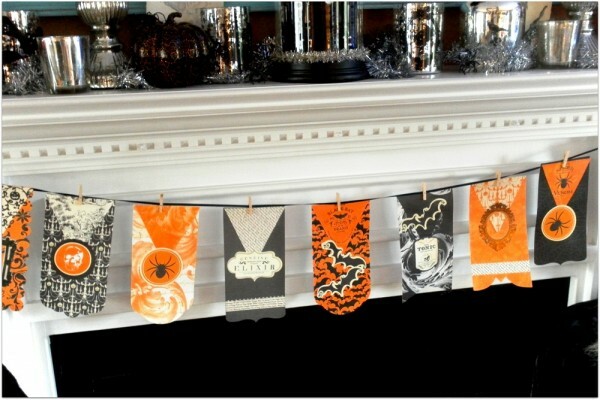 The banner is a Do-It-Yourself Craft kit I bought a while back. 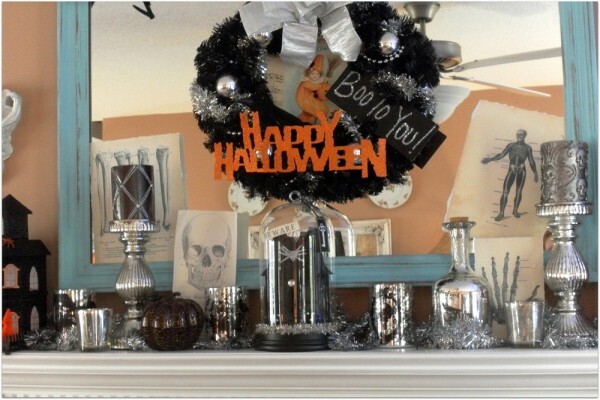 And here is the full on view of my Halloween Mantle. I love the creepy old man. He talks and his black crow sidekick flaps his wings and cackles. Really amazing!! You have a great eye! Thanks so much for the link!